I haven't shared the link yet no. I did say that people can always leave a message in this thread and I'll select some people to test. Probably 3-5 or so. And probably in the coming week. I'm just working on the login/user stuff right now and waiting for a reply from FFG concerning any legal issues. Just an FYI ... I submitted my D1e issue to FFG Legal on Feb 16th, 2015. I received their reply on March 19th. 2015. Just saying ... be patient. Nice. Current project I'm the architect for we're using Bootstrap with ASP.NET MVC, and ASP.NET Identity for the authentication. Been years since I've even looked at PHP. The stat feature will turn useful in regard to the perennial quest balance debate. It would be nice to track wether encounters/quests were played with house rules, and which. What kind of house rules are we talking about here? The game itself has enough exceptions to its 'normal' rules as it is (items, or quest guidelines,..). It would be pretty hard to start implementing/tracking everyone's house rules as well. You are right, it is hard to model house rules in a structured way. Maybe, on the "Save Quest Details" form, there might be a "Played with house rules" checkbox. 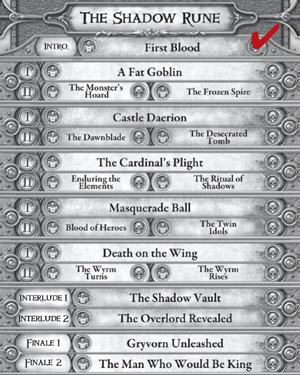 Upon checking the box, a textarea would appear in which the user could list the house rules used in the play session. I also would like to test the beta version. Currently I've let in 2 people to test (ND Jones and any2cards) and we have stumbled upon some bugs that need fixing before I will let in any more people. One think I´m wondering, is how much backtracking you can do. I suppose you can save your campaign track on the server, but if you make a mistake and have no backup then would you need to start from scratch again? Maybe it should be possible to restore from before the last quest and always have that particular save point available? Also, one thing that would make this interesting to me, is the ability to save details between encounters of a quest. So taking notes of what's been going on for the next session to come would be a nice thing to do. About the cards (equipment, abilities), do you only have their name, or can you hover your mouse and see the card itself? So I think just having a delete option per quest to start over should suffice. The saving between encounters has been requested before, but it's a big thing to implement. I will think about it. For now it's just the name, and it will probably stay that way. The point of the site is having a place to track your progress. Not to be able to play the game without buying it, so to say. To me it feels like showing the card contents is essential for planning. The alternative is to sit with your client and the cards on the side, which is what I´m already doing. If you managed to show the cards then your tool would be an instant buy for me. I don't think Atom4geVampire plans on making this something you can go out and buy, just a website anyone use to improve their D2E experience. I could be wrong but that's the impression I got. This would be a question for FFG themselves, but I don't think they're worried about the cards being online. You can't get the full experience of the game with just pictures of the cards, you need to go out and buy the map pieces/quest guide/etc. There are some websites that list the cards already, which makes me think you could implement this if you want. http://www.descentinthedark.com/2nd/ for example. This site isn't fully up to date but it has a pretty good base set of cards, I reference it pretty frequently. By "buying" I meant buying the idea, but yes, I don't think he could sell the product anyway due to legal issues, it probably has to stay 100% fan-based or he'll get sued by FFG. There's no doubt about that. Anyhow, about the cards, there are plenty of other examples of fan-based clients/utility tools, especially for deck building games, where the full cards contents are made available. And you get new cards either manually, or through API or the likes. From a user perspective, you get the card names but then when the mouse is on it then it displays the picture. I really don't think there would be any problem for doing so from a legal perspective. And I agree with ND Jones that you can't possibly experience Descent just by using your planning client and card contents, to me that's not a valid concern. I know I´m far from being alone here championing the display of full cards. I think it's pretty key, a must-have. 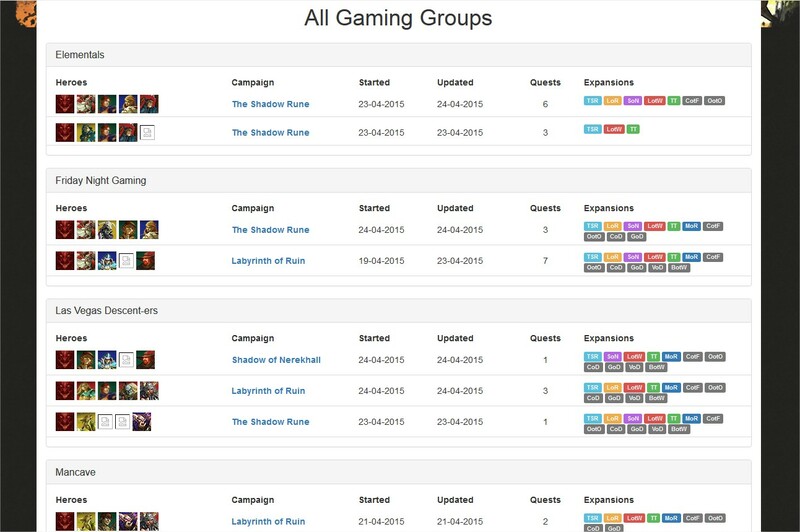 To be honest with you, if the goal for this tool is to facilitate campaign planning and centralize everything required to do so then you can't possibly exclude cards from it, they are absolutely key in everything. Otherwise the tool is just a glorified spreadsheet with the art behind the heroes name and logic points allowing you to select things, but in practice you still need to refer to the game components. 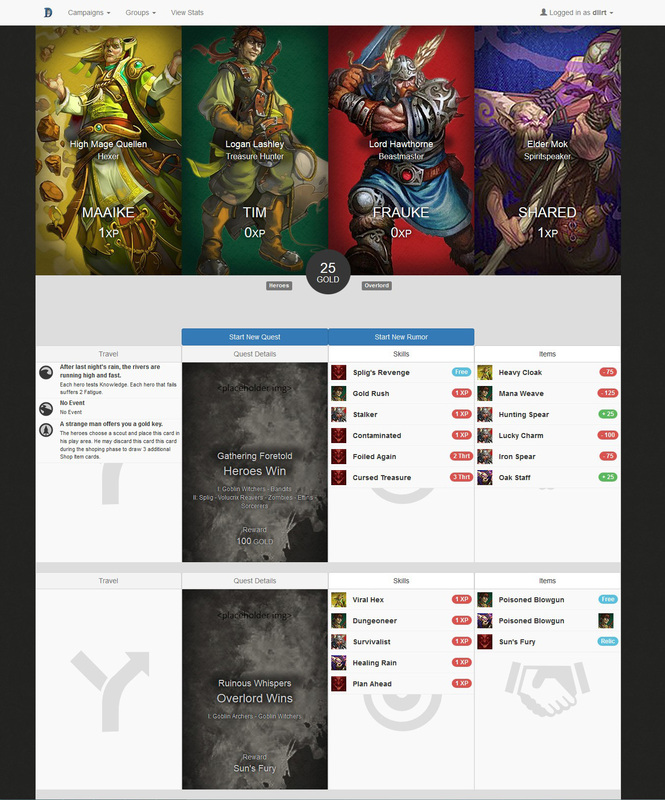 If you add cards then you can do everything in your client and that's a pretty big deal. Just to be clear, what I´m saying is that IF you can do it (technically speaking), then you should probably do it. And yes, I know about that site as well but the fact that it's still online doesn't mean FFG is actually ok with it. But sure, it's something that might be implemented, but at this point I don't really see the reasoning behind it. It's not really about 'planning' your next quest, but 'recording' your previous quest. "Ok, let's travel to the quest. Ok, we got this event, and this one, and this one." *grab laptop, tablet, phone, whatever* - Click on 'Add Travel Events', select each one in the interface and save. *grab laptop, tablet, phone, whatever* - Click on 'Add Quest Details', select who wins what monsters you used. I don't see how seeing a tooltip with a description of the card after you have already saved the fact that you've obtained said card, would help with planning in any way. the tool is just a glorified spreadsheet with the art behind the heroes name and logic points allowing you to select things, but in practice you still need to refer to the game components. That said, it's not like I haven't thought about adding that option myself. It's just that to me, it's not a core functionality. OK no worries - I´ll try to elaborate then. As the game master (the dude stepping up for organizing everything), I need a way to record our progress in the campaign, BUT I also need to prepare the game for the next quest. If your core assumption is that the "preparation" work is done externally to your client, then fine. You just need to type down the name of everything and "that's it". What I thought your program would also do, is to give a snapshot of the current stats/skills, so that you get a clear idea of the hero composition and can select your open groups, your next OL hand, your next OL/plot card purchase etc. But even without the "planner" function, wouldn't it be an asset, still, to provide this snapshot I was talking about? your next OL hand: I had planned on adding some functionality for keeping track of 1 hand of at least 15 overlord cards, to differentiate between those you are actively using and those you might have put aside. But wasn't planning on any deck building functionality where you can keep track of multiple decks for situational use or whatever (I know, it sounds cool, but also sounds like a lot of extra work, and (to me) not a core feature of the website. One thing I noticed about what you have presented is the extensive use of the art to inform the user what's going on. I would suggest going to circular icons for the individual heroes, this will take up less space. I have more thoughts on what you could do to you campaign manager. If you'e like to know what they are, shoot me a PM. This tool seems really useful if you are running Descent with multiple gaming groups. Is it possible to have multiple campaigns saved at the same time in your tracker? I saw that the full card contents were displayed when moving the mouse on an item like the Chainmail. Nice!